Sometimes during the day you are hungry and you want a snack, but you look for a good tasting treat that won't ruin your hard earned shape. QNT PEANUT TIME is the right snack for you! This is a delicious protein bar, loaded with peanuts, that can fuel your muscles with 20g of quality protein and just 2.4g of sugar. That's an incredible feature for a delicious, balanced snack that is perfect in any moment of the day. QNT PEANUT TIME is a truly balanced snack, because it contains 20g of quality protein (from a mix of different protein sources), 20g of carbohydrates (but only 2.4g of sugar) and just 12g of good fats. 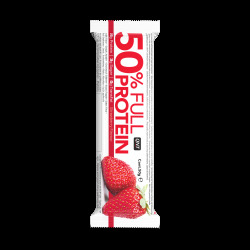 The balance between the different nutrients, makes this bar perfect for any dietetic program and its delicious taste will please just about anybody. The size of 60g and the convenient format are perfect for a snack that can be carried anywhere and eaten on the go, at work, at school, when hiking or when doing sports outdoors. The delicious taste makes it a valid alternative to ordinary snacks, but without the high level of fats and sugars usually associated with those. If you want to stay in shape while giving yourself a treat, this is the snack you are looking for. If you are an athlete or an active person, the benefits of consuming a snack which has a high protein and low sugar content are many. Protein contributes to the maintenance and growth of muscle mass, a key factor for all people aiming at improving their performance. The low sugar content is beneficial because it limits the glycemic spikes that are associated with many adverse health effects. PEANUT TIME is the ultimate snack when it comes to the great combination of nutritional value, delicious taste and convenience. INGREDIENTS: Milk protein, sweetener (E965),collagen peptides (bovine), humectant (E422), cocoa butter, peanuts 9%, whole milk powder, water, sweetener (E965), cocoa mass, soy, protein,peanut paste 1,5%, sunower oil, avour, emulsiers lecithins (soy, sunower), salt, colour: plain caramel, sweetener(E955).